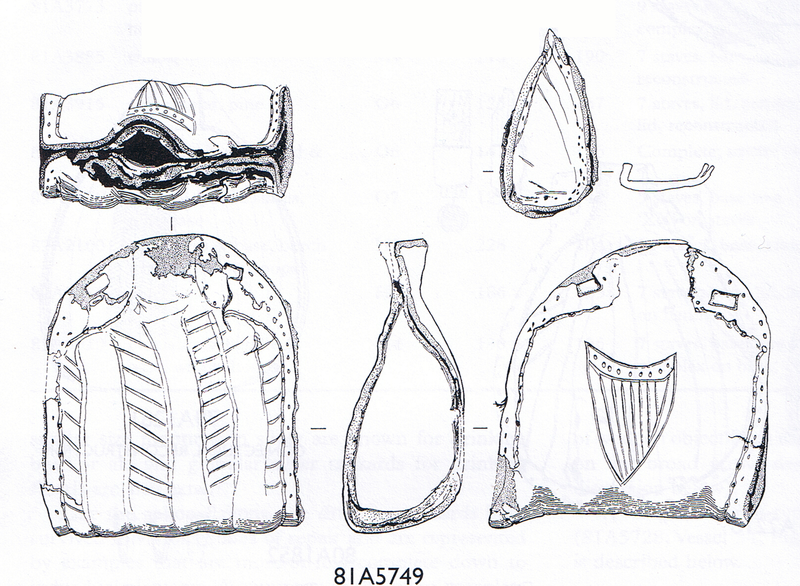 [The] mediaeval bottle does not differ much from those examples which still survive. 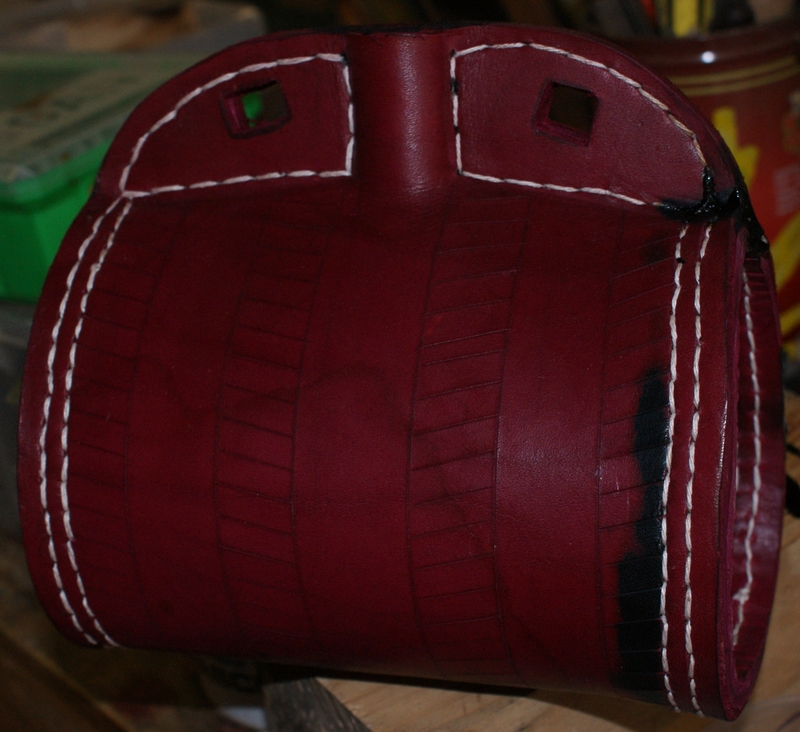 It has however three perpendicular ridges up the sides, parallel to those made by the end seams. They are purely ornamental, and are not intended for hoops, because they are not continued under the bottom (which as seen from the ground level is the most conspicuous part), and also because the middle one would, if continued, have gone over the mouth of the bottle. Some actual bottles exist in which these raised bands (always on one side only) form part of the decoration, and I believe them to be all mediaeval examples. The holes on each side of the neck in these early bottles are never round and small as if for a cord (which is invariable in late bottles), but are elongated slits as if for a thick leathern thong. This is one of my favourite costrels, as it sits at the transition point between the medieval and modern styles. It has the rectangular holes of the medieval type, but the maker then has a bet each way with the design. One side, which for consistency with the MRT, I’ll call the back (although I secretly believe it to be the front), has incised hatching enclosed by vertical lines, a vestigial form of the earlier raised ridges. On the other side is an embossed harp similar in placement and proportion to the fleur-di-lys on several later costrels. I’m not going to go in to too much detail here, as I’ve covered the construction methods before. I did the stitch spacing entirely by eye this time, and I’m fairly happy with how it turned out although my stitching is still too regular. 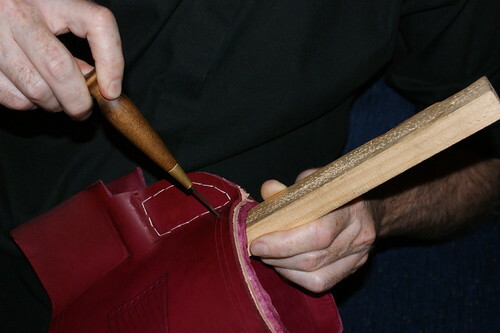 This is how I do the stitch holes at the ends. The only solution was to re-dye the whole thing black. All that’s left to do is another coat of pitch and sew in the neck gasket. A wise woman told me to junk the acrylic paints I was using and to get some real ones. 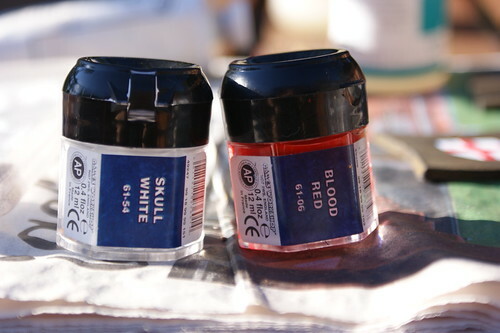 So I grabbed the Games Workshop paints Andrew and I use for figure painting. Say hello to Skull White and Blood Red. This acrylic went on like a real paint, flowed fairly well, and most importantly, covered properly. The oil was magnificent, as it always is. I love using it, but that may be because I understand they way it works best. Here’s the result. Oil is on the left column, gouache is in the middle and acrylic to the right. Iron dye is the top row and modern to the bottom. 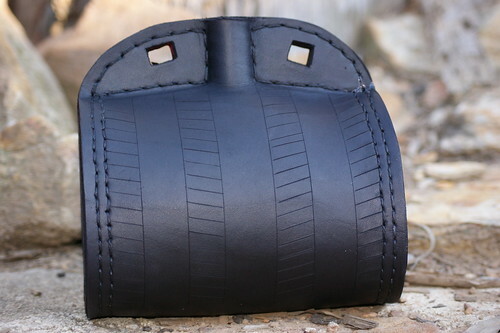 Sometimes when I’m making a leather bottel, particularly if it is for someone younger or I think they might be a little rougher with it, I’ll do a light coat of a bitumen sealer under the pitch. It is cheap, easily applied and stays slightly soft and flexible, helping to keep the bottel sealed if (when) it gets dropped or someone squeezes it and the pitch cracks. The colour shows through the honey-coloured rosin, making it look black the same as real brewer’s pitch. Costrel 81A5749 from the Mary Rose, 1545. That’s the theory anyway. I’m making a copy of 81A5749 for a young lady called, appropriately enough, Erin. 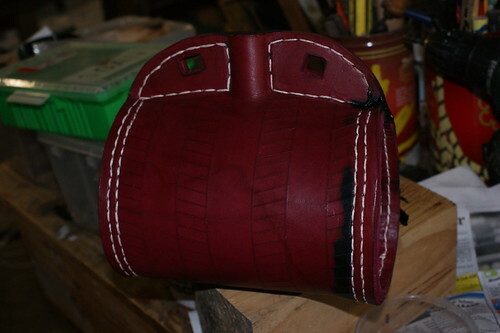 I’d stitched one end and the top seams and sealed them with one lot of bitumen and then finished the other end. The bitumen was too thick to pour so I took a short trip to the hardware and bought another litre. I sort of noticed this one was a lot runnier than the last lot but didn’t think any more about it. I think they’ve changed the formulation, you can see what happened in the photo below. Looks like I’ll be keeping this for black ones in the future. "Bum", he said, reaching for the black dye. This is probably a good time to do a post on the properties of the various sealers that I’ve been planning for some time. I’ll briefly discuss the pros and cons of each of brewer’s pitch and rosin, bitumen sealers and Envriotex. Where I can, I’ll link to the product data and material safety sheets and you can make up your own mind on what to use. Remember to use this information in the context of how often the bottel will be used, and the exposure you will have to the chemicals making it. If you are using the bottel every day, or making a batch of 30, your exposure will be considerably higher than if you only make one or two and only use it a couple of times a year. Brewers’ Pitch and rosin are chemically similar. 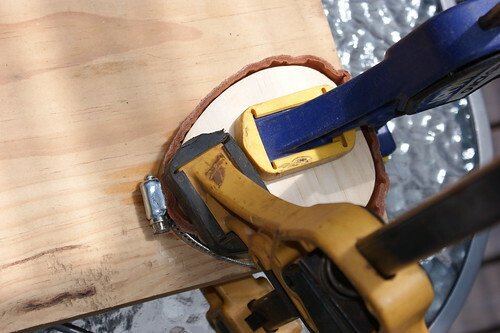 Brewer’s pitch is rosin extracted from pine wood using a reducing fire, turning it black. Rosin is extracted from the same type of timber using indirect heat so it stays clean rather than picking up soot. The chemical category of these products in this country is “vegetable pitch; brewers’ pitch and similar preparations based on rosin, resin acids or on vegetable pitch” and is similar in the other countries I’ve checked. Proving that the Internet is a broad church, while this site has some “interesting” ideas, it does have a really good discussion of the various pine-derived pitches. The MSDS is on the same site, I’ve linked to it here. The advantages of the pitches is that they are thermoplastic, so are soft when hot and harden quickly upon cooling. I can melt a pot and do two or three thin coats in the space of 20 minutes. It reflows, so can be softened with hot water or a cool oven. 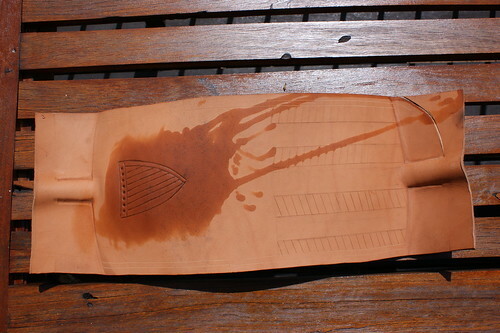 Minor spills can be scraped off leather without affecting the top coat of wax. They can be brittle if mishandled and do have some fumes when molten that probably best aren’t inhaled, and can cause some horrific burns if you aren’t careful. Considered to contain volatile organic compounds, use is prohibited in parts of the USA. Pitch can also flavour drinks slightly when new (the same taste as in the Greek wine Retsina) but the flavour is easily removed by leaving your bottel or jack filled with cheap wine overnight. You can’t use pitch with high-alcohol drinks like whisky, or with hot liquids, but it works fine with wine, beer, cider and other cold drinks. As a traditional material, it hasn’t been exposed to as much scrutiny as the more recent materials, the best health advice I could find is “Probably not toxic.” Given that rosin is used as a food additive, I think it’s pretty safe for occasional use. Bitumen is an organic hydrocarbon creating by decomposing organic materials, particularly pines, under pressure over a period of tens of thousands of years (or if you own the Great Flood website, somewhere around 4,000). As such, it is chemically similar to the pitches discussed above. The commercial ones are often thinned with turpentine to a standardised viscosity. This is really a modern take on Stockholm Tar, which is black pine pitch thinned with gum turpentine. Once the turps has evaporated, they are generally approved for use on roofs and tanks containing drinking water. 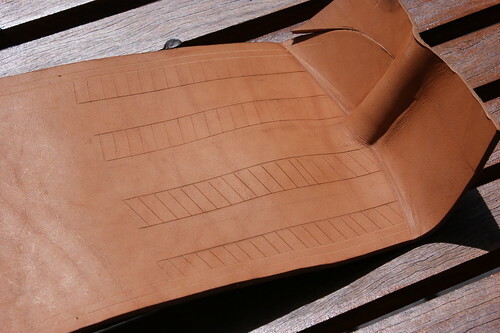 Bitumen has a longer pedigree than pitch, although sealing leather vessels may not be a perfectly accurate use. As an evaporative drying process, it doesn’t carry the same risk of burns and the hot-melt pitches but otherwise has the same advantages, disadvantages and prohibitions as the pitches. 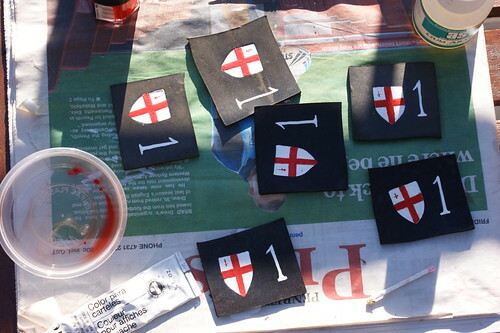 It takes a day or two to dry and as I found, can leave stains that affect the appearance of the finished article. As a modern product the marketing and safety materials are more thorough and specific. Epoxies are synthetic thermosetting resins which have a wide variety of industrial and domestic uses. 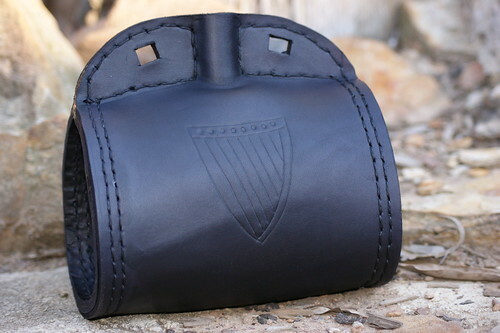 The most common one used in leather vessels in EnviroTex.This particular product cures to a thick, glossy coating in about 8 hours at 21°C, and reaches full strength and toughness in about 48 hours. This durable, resilient material requires no polishing to produce a high gloss. Proponents claim it to be food-safe, although this is only when fully cured after 7 days at 21°C. It is theoretically usable with hot and high alcohol liquids, but see the health concerns below. 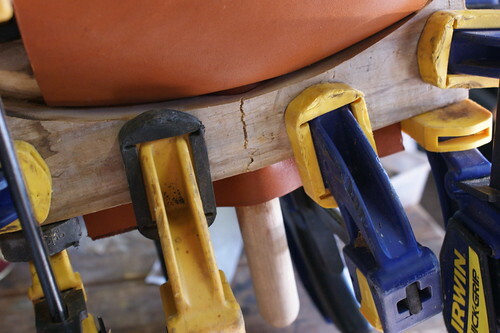 I’ve seen it in a few leather mugs that have cracked and leak, the only option is to remove it completely and recoat. The price in Sydney is four times the cost of an equivalent amount of the brushable bitumen sealer. The primary health risk associated with epoxy use is sensitisation to the hardener, which accumulates over time, and can induce an allergic reaction and asthma in sensitive people. Like me. And when I say “over time”, it took me a week of once-daily exposure to glycols and DMPS to become sensitised. Now the interesting bit. Bisphenol A, which is makes up 85% by weight of EnviroTex, is a known endocrine disruptor. The use of BPA containing chemicals is banned in any reusable food or beverage container in the state of Connecticut, and Maine will have the same ban in place from 2012. On March 29, 2010, the US EPA declared BPA a “chemical of concern”. Much of Europe and Australia have no concern as long as the compounds are used as intended. This specifically excludes the use with heated liquids, where it is known to emit oestrogen-like compounds. Environment Canada listed bisphenol A as a “toxic substance” in September 2010. The MSDS is here. Given my status as the canary in this coal mine, I won’t use it, but given the number of times you may use it, you may find it appropriate.